Would you like be redirected to the mobile version of our website? AC/DC, Braveheart, Red Hot Chili Peppers, Guns N’ Roses on future guitar! 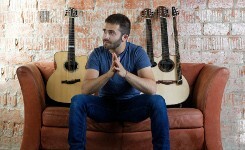 Using up to five guitars in the same piece, modified capos, and self-conceived stratagems, Luca continually leaves his audiences in awe and wondering what’s next for the up-and-coming guitarist. 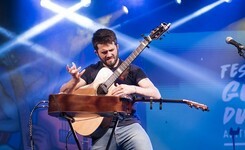 In addition to his musical abilities, Luca brings an enthusiastic energy to the stage that makes him a true entertainer. His “What If? World Tour”, in which he explores even more approaches to guitar playing, brought him in over 10 counties and it’s now finally in Germany. 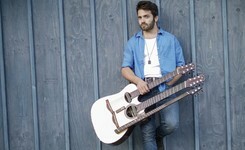 Luca will finally show us his self invented Triple Neck Guitar, which obtained once again viral success with over 40 million views online. His performances with this instrument have been featured in magazines all over the world such as NME, Spiegel and La Repubblica, and even grabbed the attention of Red Hot Chili Peppers. To top it all off, the tour features the outstanding award winning singer-songwriter and loop-station-artist Meg Pfeiffer, fresh from winning the “European Songwriting Awards”. Meg alone rocks the stage more than an entire band. After getting standing ovations in USA, Canada, China, Russia, Italy, Poland, Latvia, Estonia Austria and so many more counties, she is ready to bring back her incredible energy to her native land. A show not to miss! Get the latest news on the »Jazztage Dresden Festival« and subscribe to our newsletter!